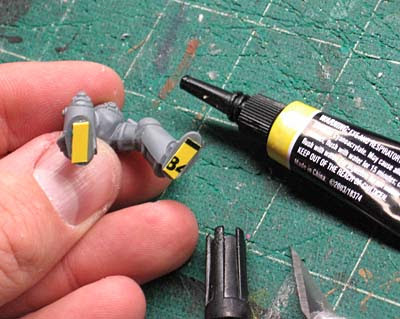 In order to make your models look like they are standing on top of the flock and sand on their base instead of looking like they are slightly sunk down into it... all you need to do is glue a thin piece of plasticard to the bottom of their feet before you glue them down to their base. In this case, I picked up a plastic "For Sale" sign at my local hardware store and cut little pieces to fit under each foot. Also are you gonna get disqus back soon? That is one of the best, most totally awesome, simple suggestions I have ever seen. Great, great tip! Consider it used by me going forward. Peter: The only time I add the flock and base stuff BEFORE adding my model is when I'm doing something like a rock outcropping or something big like that. For my rank and file guys without anything fancy, I just glue them to the base and then add the basing material after that. I don't think I'll be getting Disqus back. While it has some nice features, I don't want to get myself back in the same position I was in only a few short months ago with so much extra coding and blg work that I get in over my head. That and I end up spending more time working on my blog than working on my hobby. Nice tip, but I prefer my marines sinking a bit; after all, when you're wearing a 600+ pounds armor, it's normal to sink somehow in the ground. XaviarHarkon: I know what you mean. I'm not going back to fix my older models either, they're just going to have to stay that way. That's a great tip. I usually have the sinking effect, but only because I've developed the habit of completely assembling the model before basing and painting. I'm trying to break this habit. Considering my guardsmen are on rubble, I guess they've been packing away the pies, because they sure are sinking! Here's another one that surprised me recently: I have no grasp of colour at all, so when I need to mix something (you'll see my Leman Russes soon with their odd colouring) I ask my wife to do so. Know what she did? oni: I completely assemble mine as well before adding them to the bases. This little bit under their feet makes all the difference. I've done it with all my recent White Scar Terminators and love the result. Drax: My wife bought me a storage rack where the paints go in on their sides and I can see the all the actualy colors much easier now... similar to your solution. Makes finding a particular color easy. Elegant and simple - just brilliant. Thanks for the tip Ron! This is a great idea. I recently read about it and have recently started using it. Any kind of scrap plastic can be used. I favor those fake credit cards you get in the mail, but used gift cards work well too. Kevin: Now that's the perfect use for those. Thanks for the excellent tip.